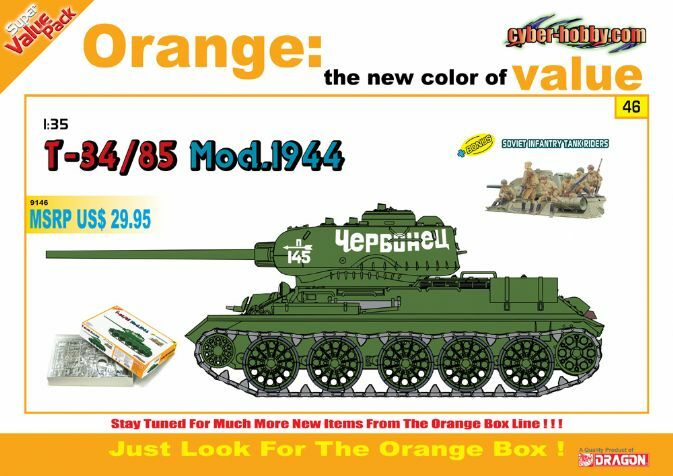 Dragon’s popular 1/35 scale kit of the T-34/85 Mod.1944 is joined, in Orange Box’s inimitable way, with a set of identically scaled Soviet Infantry Tank Riders. The tank and infantrymen are a perfect match, as photos and wartime footage commonly show Soviet soldiers riding into battle in this way. This Orange Box set allows modelers to recreate such a dramatic scene without a single other item needing to be bought or added. The figures are expertly posed grasping an array of weaponry as they ride towards the frontline. Usually a Dragon figure set contains four soldiers, but this set actually has six, making it even more useful. 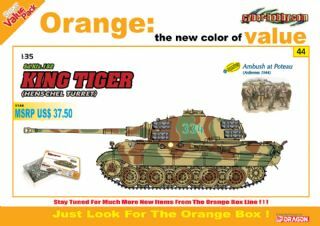 What you have here are all the ingredients to create a compelling Eastern Front diorama...at an unbeatable Orange Box price!